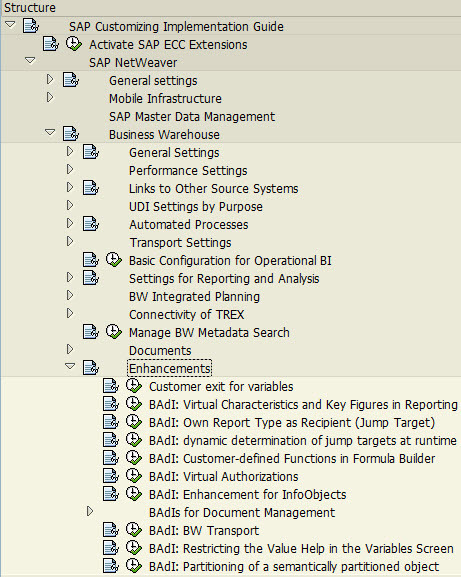 Need to tune up your webdynpro for ABAP (WD4A) development e.g. for performance? ABAP programmers are usually familiar with TA SE30 – ABAP Runtime Analyses. There is a possibility to use this TA for WD4A as well. It is just little bit tricky how to set it up. 1. In TA SE80 browse for your WD4A object. 2. Select menu Goto->HTTP Service maintenance; this leads you to TA SICF. 4. On next popup windows make settings and Activate it. 5. Start your webdynpro and perform all activities within it that you want to. 6. 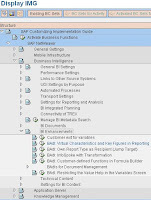 To see analyses go to TA SE30 – ABAP Runtime Analyses and see section Performance Data File/Other file. BAdI: Web Item "Individual Document"
BAdI: Web Item "List of Documents"
For its documentation refer to 691154 - SAPI with BAdI: User exits in SAPI with BAdI interfaces and here and here. You have possibility to set User Breakpoint (formerly External Breakpoints) in ABAP backend to get into debugging mode while you invoking this code outside (e.g. via RFC or HTTP requests) of ABAP backend. Such a breakpoint is set on application server on which are you currently logged in. You will not get into debugger if your request is send to other application server in which you haven’t set break points. 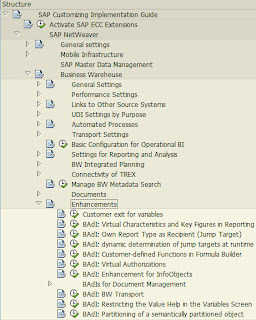 To obey this behavior SAP is providing transaction SRDEBUG where you can activate your User Breakpoint in all applications servers. There is one more useful transaction called RSBREAKPOINTS via which you can manage your breakpoints. Basically this TA deals with tables: ABDBG_BPS (ABAP Debugger: Breakpoints), ABDBG_INFO (ABAP Debugger: Information on Breakpoints) and ICFATTRIB (Description of ICF Attributes (Trace/Debugging)).